Bears Aren't Monsters After All! Did you know that there are many types of bears? Some people believe that bears are monsters but they are really just a type of animal that rarely hurts humans. One type of bear is the polar bear. The polar bear can swim and roam for many miles in search of seals, which they eat; polar bears live in the Arctic and can weigh nearly a ton. Their harsh living conditions have helped them adapt into master survivors. 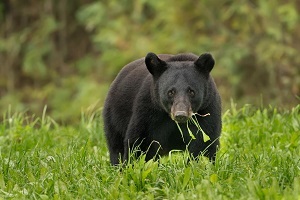 Another type of bear is the black bear. The black bear usually weighs no more than 500 pounds. This bear is also an excellent climber. Black and grizzly bears are both omnivores, which means they eat everything from dead carcasses to ants. They can also eat grass, roots, nuts, and berries. Although black bears and grizzlies are similar, their main difference is that grizzlies are not good climbers. Now that you know more about the different types of bears, maybe you will not think of them as monsters anymore!